I'm a little slow on the uptake on this one, but it's via wikinews on the 4th of February. 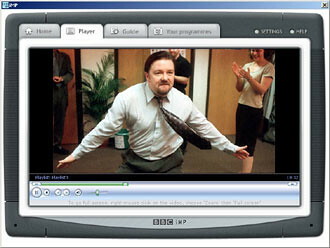 The BBC today unveiled it's plans for a new iMP player with which people in the UK will be able to download any BBC tv or radio programme for a week after it has been broadcast in the UK. These downloads will have a limited life, becoming inactive a week after the show has been shown live in the UK. The BBC are justifying their proposed decision to restrict the use of the new player to those using a UK Internet service provider on the basis that it is only UK citizens who pay the television licence. Also the following is an excerpt from the full anouncement from the BBC. iMP is a broadband service the BBC are developing that allows you to use the internet to download and watch programmes from BBC TV and Radio. Users can also set iMP to download programmes that they'll miss, which are coming up over the next seven days. It's not available yet but soon holidays, family get-togethers and other distractions getting in between you and your favourite TV and radio programmes could be a thing of the past! iMP is pretty similar to the bbc.co.uk RadioPlayer which allows you to listen to any BBC radio programme from the last seven days. The main difference with iMP is that you'll be able to access TV programmes as well. I can't figure out for sure wether they're using digitally rights encoded files (DRM), they may just be locking the files to their server by using a streaming system like Real Player or Win Player so the files can never fully leave the server without some sort of hack. Why this is important is because it's from out of these experiments that the future of broadcast television will come. Which is to say when the major players stop using only cable, satelite and the airwaves and start using the internet as a means to reach out to new customers. This future may look nothing like the BBC's trials, but the success of these early trials all important. I hope to hear more on this in the future.